Responsible gambling is the buzz-phrase in online casinos right now. With so many real money games so easily accessible by players in the UK, what starts out as a fun pastime can escalate into something more serious. 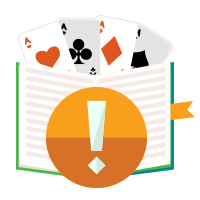 But what is problem gambling, and what are the signs you may have an addiction? More importantly, what can be done to combat it? Online slots and table games, for many, are fun hobbies played on a quiet evening with a small bankroll. You win, you bank the winnings; you lose, you nurse your wounds and live to fight another day. But for some, gambling becomes their life: they gamble to overcome boredom at home or work, and gambling on casino games consumes every waking hour. For addicts, losing becomes an epidemic: losses spiral into debts, debts spiral into theft and deception as loved ones are lied to, more cash is borrowed or stolen, and the pattern repeats itself. For gambling addicts, winning no longer gives them a buzz; all they care about is getting more and more fixes, win or lose. Do you gamble until you're broke? Do you keep on betting, even when you've won a large jackpot? Do you bet at stakes you can't afford? Do you lie to family and friends about the level of your casino gambling? Do you take out your casino losses on loved ones? Are you depressed about your gambling? If players answer yes to any of these questions, there may be a problem. It's time to get help, either through self-exclusion or by contacting a professional body if the problem is severe. On a base level, there are certain things you can do if you think you have a problem. Don't chase losses, particularly if you're on a bad run, and only bet with cash you can afford to lose. It's worth considering opening a separate bank account, without an overdraft facility, which is ONLY used for gambling. Deposits and withdrawals all go in and out of this account. This way, you can see what you've gambled, won and lost, over a set time period. Taking a break, even if you're winning, is vital too. Online casino play is so accessible that it's easy just to log-on and play for a few minutes. But accessibility, especially if you're bored, can lead you to make silly decisions and lose cash on games you might not understand or be able to beat. Finally, consider installing specialist software on your PC or Mac which monitor and limit your play on casino sites. GamBlock (www.gamblock.com) and BetFilter (www.betfilter.com) are two leading apps. Online casinos take responsible gambling very seriously. Most leading casinos have measures in place to help players who think they may have a problem. These can range from setting deposit limits over a weekly or monthly period, and activity alerts to allowing players to self-exclude. In addition, trained customer support staff can be on-hand to talk over problems. Self-exclusion can usually be set up to stop you accessing your account for six months to three or four years. Casinos are unable to unlock your account until the exclusion period is over. If players try to side-step self-exclusion and open a new account under a different name and address, casinos will have security measures in place to prevent it. If self-discipline or self-exclusion aren't enough, and you think you have a more serious problem, talking to a trained charity might be needed. There are several organisations in the UK which can help with problem gambling. - Provides support and counselling over the phone to people affected by gambling addiction. - A registered charity in the UK which also provides phone support and counselling. 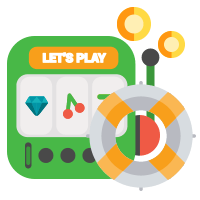 - Rather than over-the-phone support, GambleAware provides a specialist step-by-step programme aimed at tackling problem gambling in addicts.